Enter to win one of five copies of The Soul Retrieval on Goodreads! Giveaway ends May 05, 2015. The Countdown Begins: Only 5 Days until the public launch of The Soul Retrieval on March 31st! In only ONE week, The Soul Retrieval will drop on its Book Bomb Date of March 31st on Amazon. Everything is set and ready to go. And I'm so grateful for all of the enthusiasm and support from you! Only two weeks to March 31st – the launch date of my novel, The Soul Retrieval, on Amazon! Behind the scenes, there are wall-to-wall marketing deadlines. I’m delighted to report early reviews are positive. And I’ve been hearing from folks all over the country about this Book Trailer Teaser featured on YouTube. Thanks for spreading the good word! Free E-Book Version of The Soul Retrieval -- on March 31, 2105! There are many benefits of getting the free Amazon Kindle App now. One is being ready to download The Soul Retrieval Kindle e-book for FREE on launch day – March 31, 2015! 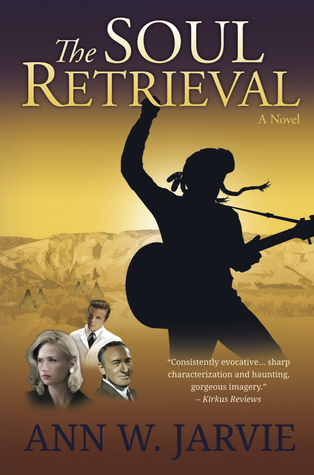 The Soul Retrieval is an exciting and suspenseful new novel that Kirkus Reviews describes as “Consistently evocative … (with) sharp characterization and haunting, gorgeous imagery.” Be ready. Get the e-book for free on March 31st. Please "Like" my New Author Facebook Page! To learn about upcoming March 31st launch-week promotions, FREE e-book download days, giveaways and more, please LIKE my Facebook Author page, created today.